Let James Beard Award–winning authors and hometown heroes Matt Lee and Ted Lee be your culinary ambassadors to Charleston, South Carolina, one of America’s most storied and buzzed-about food destinations. Growing up in the heart of the historic downtown, in a warbler-yellow house on Charleston’s fabled “Rainbow Row,” brothers Matt and Ted knew how to cast for shrimp before they were in middle school, and could catch and pick crabs soon after. They learned to recognize the fruit trees that grew around town and knew to watch for the day in late March when the loquats on the tree on Chalmers Street ripened. Their new cookbook brings the vibrant food culture of this great Southern city to life, giving readers insider access to the best recipes and stories Charleston has to offer. No cookbook on the region would be complete without the city’s most iconic dishes done right, including She-Crab Soup, Hoppin’ John, and Huguenot Torte, but the Lee brothers also aim to reacquaint home cooks with treasures lost to time, like chewy-crunchy, salty-sweet Groundnut Cakes and Syllabub with Rosemary Glazed Figs. In addition, they masterfully bring the flavors of today’s Charleston to the fore, inviting readers to sip a bright Kumquat Gin Cocktail, nibble chilled Pickled Shrimp with Fennel, and dig into a plate of Smothered Pork Chops, perhaps with a side of Grilled Chainey Briar, foraged from sandy beach paths. The brothers left no stone unturned in their quest for Charleston’s best, interviewing home cooks, chefs, farmers, fishermen, caterers, and funeral directors to create an accurate portrait of the city’s food traditions. Their research led to gems such as Flounder in Parchment with Shaved Vegetables, an homage to the dish that became Edna Lewis’s signature during her tenure at Middleton Place Restaurant, and Cheese Spread à la Henry’s, a peppery dip from the beloved brasserie of the mid-twentieth century. Readers are introduced to the people, past and present, who have left their mark on the food culture of the Holy City and inspired the brothers to become the cookbook authors they are today. 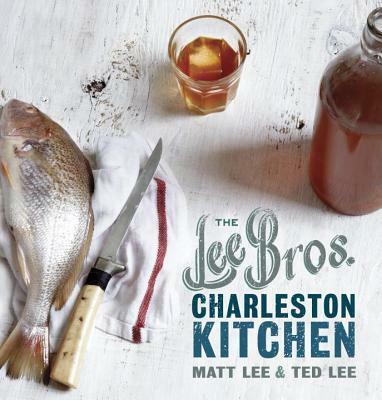 Through 100 recipes, 75 full-color photographs, and numerous personal stories, The Lee Bros. Charleston Kitchen gives readers the most intimate portrayal yet of the cuisine of this exciting Southern city, one that will resonate with food lovers wherever they live. And for visitors to Charleston, indispensible walking and driving tours related to recipes in the book bring this food town to life like never before.